The print illustrates an important scene in the battle of Mount Tobisu in 1525, when Tokugawa Ieyasu, founder of the Tokugawa shogunate, broke the siege at Nagashino Castle and defeated the army of his enemy Takeda Shingen. He was helped by a loyal retainer named Sakai Tadatsugu, who is shown here standing on an elevated platform to oversee the attack at dawn. 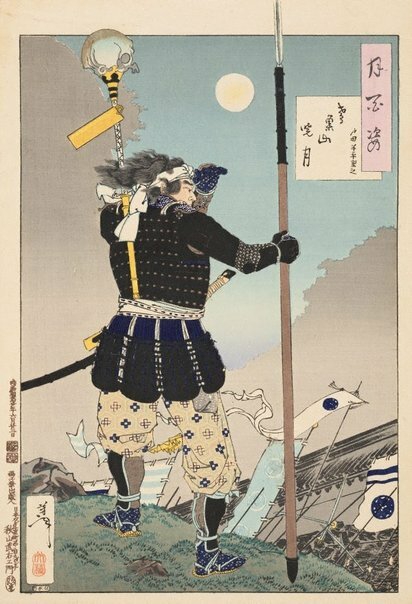 The title cartouche erroneously identifies the warrior here as Toda Hanbei Shigeyuki, another supporter of Ieyasu, who was also known as Toda Tadatsugu. Sakai’s ferocity is revealed through the human skull he used as personal standard.